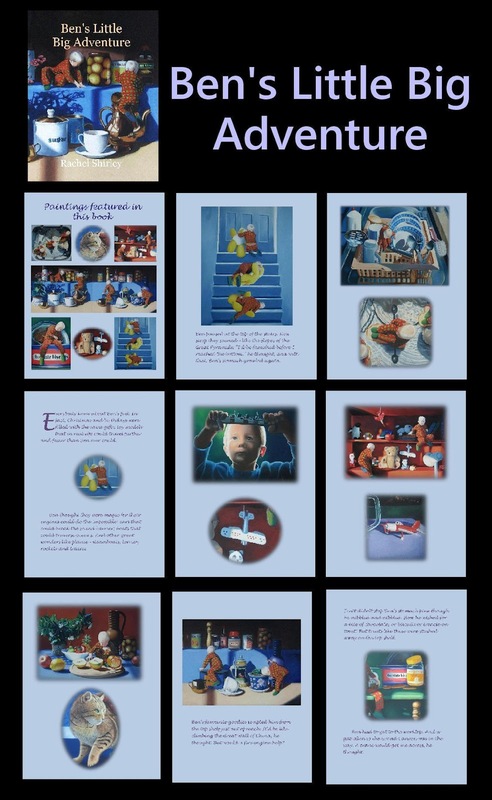 My illustrated learning book for toddler boys follows Ben’s adventure as he tries to negotiate himself through the house for a midnight snack. 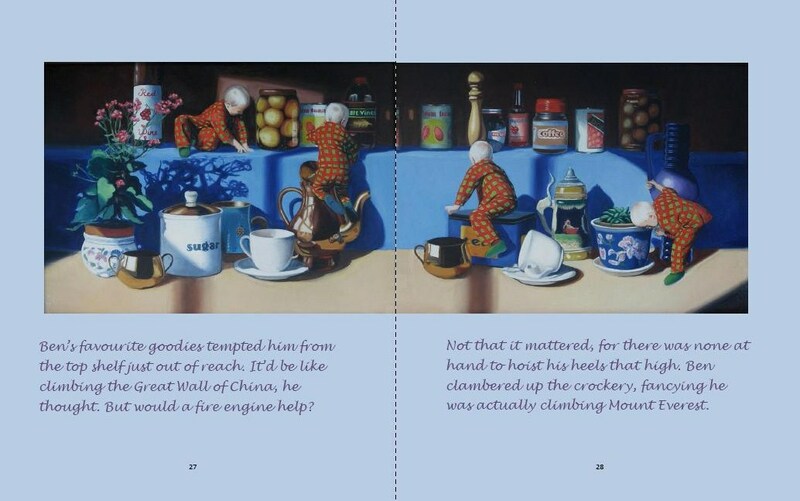 This is because he has shrunk in the night and compares the obstacles he faces with the great wonders of the world. Ben loves what he calls ‘magic machines,’ such as gliders, motorbikes, trains and cars. With each obstacle he faces, he wishes for a particular machine that will help him inch his way closer to his quest. Faced with the prospect of climbing down the edge of his bed, which incidentally he compares to the White Cliffs of Dover, Ben wishes for a glider in which to gloat gently to the ground. Of course, one is not at hand, so Ben slides down the pole of a bedside lamp instead. And so each obstacle is met and overcome in the same fashion. But will Ben reach his prized snack? Everyone knew about Ben’s fad. In fact, Christmases and birthdays were filled with the same gifts: toy models that in real life could travel further and faster than Ben ever could. Ben thought they were magic for their engines could do the impossible: cars that could break the sound barrier, boats that could traverse the oceans and other great wonders like planes, steamboats, lorries rockets and trains. Not forgetting motorbikes, airships, gliders, fire engines, liners, cranes, tanks, trucks and shuttles. Oh, yes, and helicopters as well. Ben played with his toy models all afternoon. He’d aquaplaned over the Everglades, go-karted across the Sahara and quad-biked over the Prairies. He’d even drifted over the icecaps. But no adventure would be fun on an empty stomach and Ben’s needed a snack. There was only one problem: his bed seemed to have grown. In fact everything, Ted and all. As with my other illustrated children’s books, I conceived the story starting with the images. I love experimenting with new visual ideas, in this case, illustrating a small boy sliding down a lamp pole, hitching a ride on a cat or rowing across the sinkwater in orange peel. All my illustrations have been completed in oils, entailing lots of setting up, taking of photographs and painting detail. Hard work but enjoyable on my part. My book is brimming with colour illustrations and a feast of detail and hues for the eye, the sort of picture book I would have liked myself. Screenshots of the interior as shown on this post serves to give an idea of the look of the book. 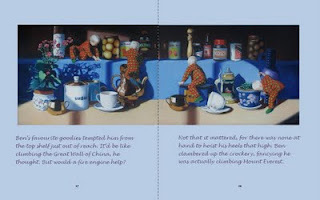 My personal favourite illustrations are Ben rolling down the stairs cushioned by a teddy bear and climbing the shelves. References to the Great Pyramids, the Great Wall of China and the Everglades have been referred to. The print version of the book is 8x10in in size, 32 pages and around 1000 words long. There are three double-paged images and countless illustrations besides. Kindle version is also available, which will prove a little cheaper. The kindle version requires a different kind of format but the elements are the same. I have written two other picture books entitled Katie’s Magic Teapot and the Cosmic Pandas and its sequel Katie and the Pandas’ Deep Sea Voyage. Both describe a young girl’s adventure flying in her magic teapot to explore the cosmos, and then the oceans respectively. Katie's Magic Teapot omnibus edition is also available. Details on these books can be found on this blog. Like Ben’s Little Big Adventure, all the Katie books are available on print format and on Kindle.